Home » 3-D Projects » Best Offer Evah! We don’t usually feature an offer, but this one is such a good one that this dog would be remiss if he didn’t bark about it. It’s part of the Weekly Deals that are available until Monday, but if they sell too many, I can’t guarantee if they’ll still offer it. But until then, you can save 25%. First, let me share a video of what’s in the kit, but you’ll have an idea of what’s in it because it’s featured on the cover of the current Stampin’ Up! catalog. So here’s the video. And listed underneath is a list of everything that’s included. The Tin of Cards kit includes all of this. 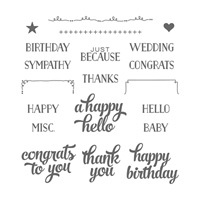 Add the ink pads and adhesives and the stamp set to the value priced kit and you have enough to get your selection of anything from these Sale-A-Bration items. Are you on Periscope? We’ll be sharing something fun today at 1pm Pacific time. Just remember 3-2-1. 3/21 @ 1pm. Aren’t I a smart dog? Not just good looking! You can watch it on your computer here. You won’t be able to give hearts or chat, but you’ll be able to see it. You can watch it on your smart phone or perhaps your tablet. Just download the app on your smart phone or tablet and look for stamperdog. If you follow us on Twitter, look for our tweet. We just love stamping with you!